One might be forgiven for assuming that all the restaurants in the Oxford Castle Quarter are chains – after all, many well-known names are housed in this restored and reinvigorated ancient castle and prison. But The Big Bang (42 Oxford Castle Quarter, OX1 1AY) is a staunchly independent British restaurant that uses locally sourced ingredients, and is Oxford’s only sausage-and-mash specialist. In addition to boasting a huge selection of sausages, it also hosts jazz evenings and art exhibitions, and is helmed by a most effervescent owner, Max, who greets you personally and even sits down at your table with you to chat. Perhaps I am easily pleased, but when someone calls this soon-to-be-40, permanently-exhausted mommy a ‘young lady’ she is tickled pink. I loved the place as soon as I walked in. The obvious decision in terms of food is the Big Bang trio (£12.49), which lets you mix and match from the extensive sausage repertoire. 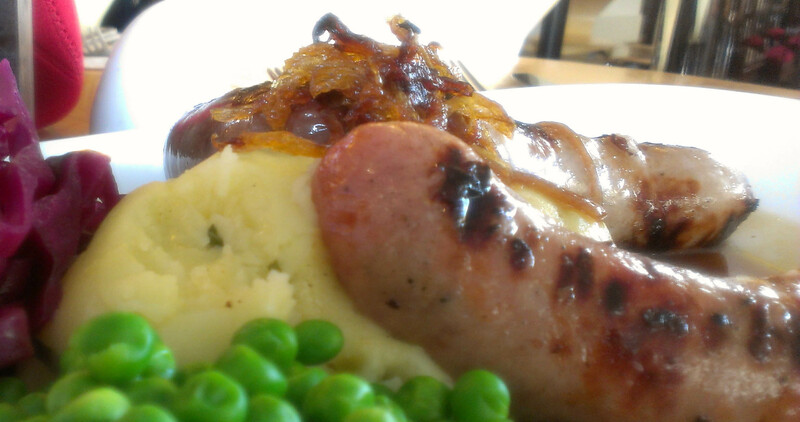 Never one to shy away from a challenge, I selected the wild boar and pigeon sausage (‘Don’t even ask, just be brave and try them out’, says the menu), the smoked bacon sausage, and the pork and apple sausage, with spring onion mash and apple cider gravy (£1 extra). The smoked bacon was my favourite, but the wild boar and pigeon came close. I goofed when I ordered the pork and apple sausage, which was more subtle and therefore overpowered by the other two; I should have gone for the garlicky Toulouse instead. Ah well, next time. I thoroughly enjoyed my meal, and am kicking myself for not trying The Big Bang earlier – especially during the summer, when they built a beach outside the restaurant, using 36 tonnes of sand and 12 palm trees, and had a Stay-and-Play session for children twice a week all summer long. I don’t know how I missed this, and I will be first in line next year if it happens again. Here’s how The Big Bang rates for baby-friendliness according to my five criteria of menu, space, ambiance, facilities, and feeding (for more on these, see my About page). Menu: Since nearly everything on the menu is sausage, you’ll have to be adept at using one hand to eat a banger if you need to hold a baby in the other arm. But this is easily done (best technique: spear the sausage directly in the middle and eat from the ends to the centre – no cutting required as long as you can keep it on the fork!) Mash is easy to eat with one hand, and so are the peas and cabbage that come with each meal. Space: The best space for anyone with a baby carriage is somewhere near the entrance to the restaurant; there are a few individual tables, which are your best choice, and there are also tables with benches, which could work in a pinch. Further into the restaurant, the tables are quite close together and there isn’t much space for a stroller. When the restaurant is full I doubt you could get one between tables very easily. Ambiance: The ambiance at The Big Bang is truly wonderful and service is stellar. As I approached the door, one of the Sausageers (yes, that’s what they call the staff!) ran to open it for me. The Baberoo received many compliments, and hilariously, my Sausageer and I were both instructed in Max’s foolproof method to tell a girl baby from a boy baby (it’s all in the eyes, apparently). When we went to visit the baby-changing facilities the doors were also opened for us without my needing to ask. And the homey way that the staff sit down with you (iPads in hand to take your order) while you choose your meal is very appealing. They have truly cracked how to be helpful and personable, and it’s obvious that they love what they’re doing. Facilities: The baby-changing facility is light and clean and has enough space to move your baby carriage around. There is a slight odour of clogged drain; I’m going to put this down to the fact that the Oxford Castle surroundings are over a thousand years old. 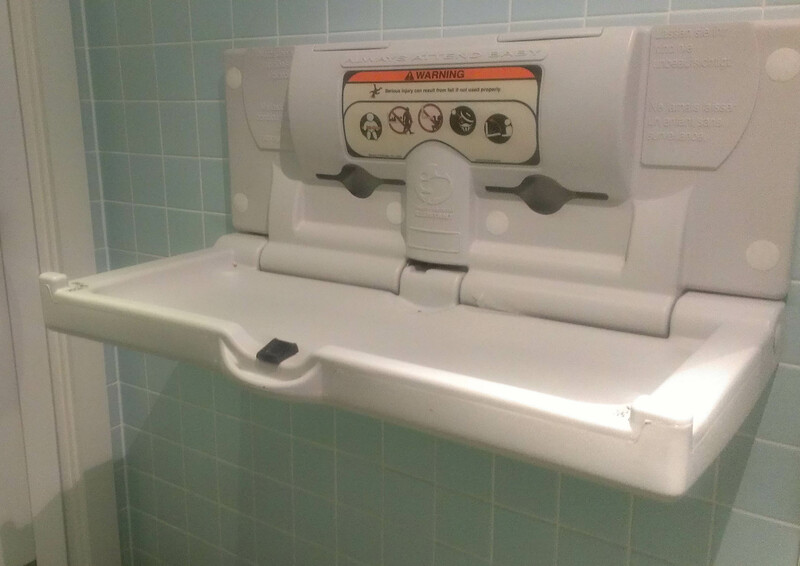 The changing table is a pull-down one of the narrower type and there’s no shelf for your changing bag. Feeding: We were offered a high chair right away, and my Sausageer also brought a plate and spoon for me to use for the Baberoo’s lunch without my even asking. The Baberoo ate her meal (brought from home) with gusto and tried my peas, which she loved. I didn’t breastfeed her on this occasion but if you are breastfeeding you can choose either a table with regular chairs or a table with benches, whichever suits you better. There are also a few squishy, cushy armchairs near the entrance, if you can snag one. In total, The Big Bang gets a 7.75 out of 10 for baby-friendliness. Go during a weekday lunchtime to ensure that there’s enough space for your baby carriage, and revel in the fun and friendly atmosphere.